Every action and choice we make greatly affects our lives, and those around us. Even the smallest stone, when thrown in to water, can cause large ripples. This fundamental concept governs every aspect of our lives, yet it’s not something we regularly think about. It is more apparent in some situations, like the more you drive, the more gas you have to buy. But we don’t regularly think about what happens to the gas once it leaves the car. In today’s world, people make decisions based on convenience, price, and familiarity, often at the detriment of the longer term impacts or consequences. This is the challenge the environmental movement faces, and school districts are no different. 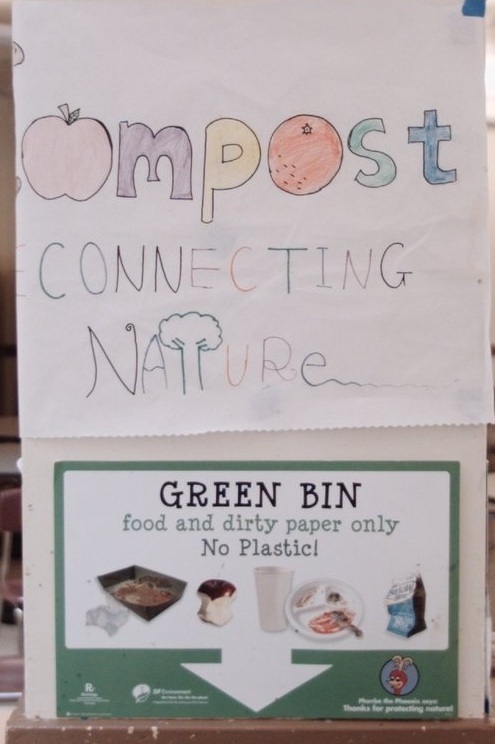 Student Nutrition Services (SNS), in partnership with SFUSD’s Sustainability Office, is dedicated to finding ways to improve the environmental responsibility of our programs. For SNS, environmental responsibility refers to the products we buy and serve, the waste we produce, the materials we use, and the energy it takes to produce them. We’re working on tackling this from all angles. In honor of Earth Day and San Francisco’s month of Climate Action, we are committed to thoughtfully making decisions to reduce our environmental footprint, by providing a more sustainable meal program and a more appealing experience for our students. The amount of plastic in the meal program is one of the department’s biggest challenges. This extends beyond just the environmental impact, and directly relates to the student experience. Those familiar with our meal program know that meals come prepackaged. While this makes it easier and more cost effective to serve, the plastic packaging makes it hard to see or smell the food, and can change the otherwise crisp pizza crust into a soggy dough. The way we prepare and serve meals is dictated by infrastructure, facilities, and space limitations. Utilizing funds from the 2016 General Obligation Bond and Sugary Drinks Distributor Tax, we have the opportunity to replace outdated equipment and test new methods of service with the goal of shifting to a buffet service model to create a more user-friendly and environmentally responsible service. In the short term, we’re focusing on creative strategies to reduce the amount of plastic used throughout our current operations, such as removing the ubiquitous plastic wrapped spork kits. In 2019, we removed all straws from the meal program, in alignment with the City of San Francisco’s recent straw ban. This is our first small step to reducing plastic, and straws are still available for students who rely on them. But straws alone are not the solution. Thanks to great work by high school students at Lowell and School of the Arts, we will be removing the plastic wrapped spork packet district-wide during the 2019-20 school year. 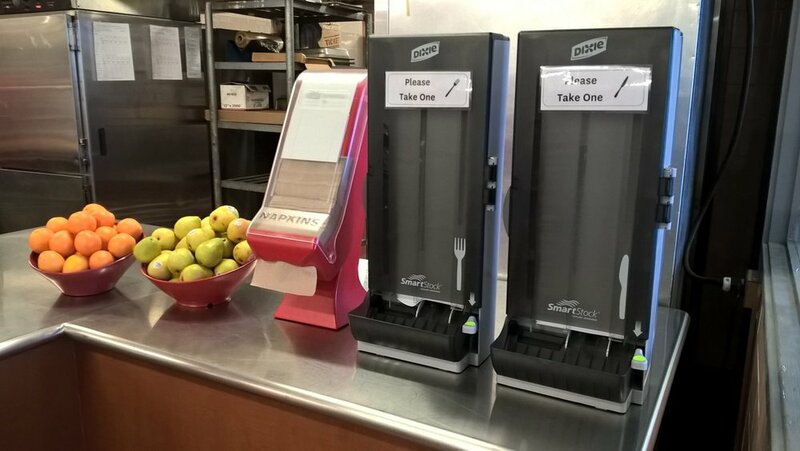 They will be replaced by single utensils, and we will be piloting the alternative of reusable utensils this coming Fall 2019 at our new McAteer Campus kitchen facility. Today, in our in-house prepared meal program, Refresh, served at our middle and high schools and early education program, 7% of the fresh produce is organic, and more than 50% is sourced locally (defined as <250 miles away from San Francisco). This includes product highlights such as fresh strawberries from Coke Farms in the Central Coast. Plus, every hot dog we serve comes from Fork in the Road, the same sustainably sourced ones you can buy at your local Whole Foods. We are also piloting a new, locally sourced, sustainably raised beef from Mindful Meats in our early education program - SFUSD’s very own menu prepared completely from scratch for our youngest eaters. In the United States, approximately 40% of all edible food ends up in landfills. In K-12 alone, which makes up only 1% of the total, this amounts to over $1.2 billion worth of food thrown away per year. Yet, while so much food is wasted nationally, in San Francisco alone, 1 in 4 residents is faced with hunger on a daily basis. According to the newest SF Food Security Task Force report, food insecurity is a growing concern. At SFUSD, more than 50% of all students qualify for free and reduced meals, but with the high cost of living, there are many more families still struggling to make ends meet. Thanks to recent legislation, schools are now able to reduce the amount of food we are throwing away by making it available for students and needy families. Share Tables in the lunchroom let students leave and/or take any leftover, uneaten food to enjoy during meal times, or take home for later. After, schools can donate leftover food to non-profit organizations for distribution to parents or others. We’re working on setting up a donation program in 2019-20 SY, with the priority of first making food available to SFUSD families, and then to the broader SF community. On the back end, enhanced tracking of food production, orders, and items served, help us to cut down on the amount of unserved food waste, as well as tailor our menus to what students favor most. 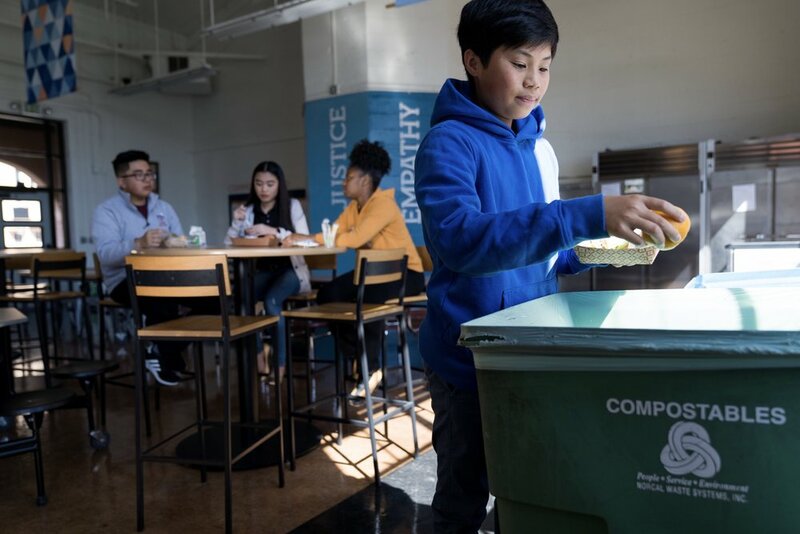 In partnership with UC Berkeley School of Public Health, we’ve collected 2 years of plate waste data at 24 middle and high schools, to measure the waste we produce, and identify our biggest opportunities for impact. 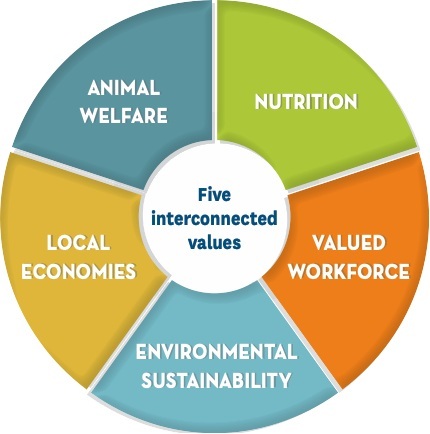 To truly shift the practices of our food system will be a team effort. As a program that serves more than 37,000 meals per year, every small change we make can have a massive impact. In our efforts to prepare our next and future generations, we have a responsibility to create systems that are sustainable, and that we help do our part to make sure the world will be able to continue to sustain them. For more information about our work on becoming a more sustainable meal program contact Systems Innovation Manager Lauren Heumann at HeumannL@sfusd.edu. Rise and shine, San Francisco! March 4 - 8, 2019 is National School Breakfast Week and schools across our City are celebrating the most important meal of the day. For the last three years, Lincoln High School Senior Stephanie Liu has worked with Student Nutrition Services (SNS) as a Fellow of the School Food Advisory and she thought it was time she understood what a day in the life of one of SFUSD’s Dining Staff was like…….